For many travelers, going on safari is the ultimate “bucket list” trip. Seeing wild game from the comfort of a jeep or van is an extraordinary experience. But not all safaris are alike. “There are many ways to explore Africa’s wilderness,” says Simon Gluckman, President of Intrepid Expeditions and a partner of FarewellTravels. Simon, who was born in South Africa, specializes in customizing safaris. He is a firm believer that visitors to Africa should not only go on game drives, but participate in other activities as well. Below, he shares some of his thoughts with us. FarewellTravels: What are some of the activities you recommend, Simon? Simon Gluckman: A guided walking safari is always my first recommendation. Though the game drives allow you to see the most amount of wildlife at closest range, a walking safari affords you the opportunity to see and touch the smaller aspects of the bush. Not only will you learn about the different animal tracks and various types of vegetation, but also how locals have survived off the land for generations. A walking safari is more or less a nature hike and should be viewed as such. Most animals become skittish when they encounter humans on foot so you should not expect to get as close to animals as you would in a vehicle. FarewellTravels: Walking on safari is certainly desirable, considering that day after day of game drives adds up to zero exercise. Are there countries that are better for this? Simon Gluckman: Most countries will allow you to walk while on safari but there are certain parks/reserves within each country that are better for walking than others. Mana Pools and Hwange National Parks in Zimbabwe and South Luangwa National Park in Zambia are parks where you can take walks ranging from half a day to several weeks. There are also select areas in South Africa, Botswana, and Tanzania that can be good for walking. FarewellTravels: Are you always with a guide when out in a canoe or a mokoro? Simon Gluckman: Absolutely. The potential of encountering animals such as hippos is possible, especially when canoeing. Your safety is always the #1 priority so your guide will do everything possible to ensure you keep a safe distance from any dangers. FarewellTravels: What is the proper etiquette for visiting a village? Is it okay to take photos? Are you expected to give the villagers anything? Simon Gluckman: Usually villages are very welcoming to visitors. Taking pictures though varies from village to village. Some locals are absolutely fine with it while others prefer you not to. The best bet is to ask your guide before you visit. It is okay to give gifts as long as it is done appropriately. I often recommend guests bring pens or note pads and tell them they must only present the gifts to the village elder or teacher – never hand the items to the kids as chaos usually follows! Avoid bringing sweets. If you want to make a monetary donation it is best to discuss with your guide and he/she will talk to the appropriate person in the village. 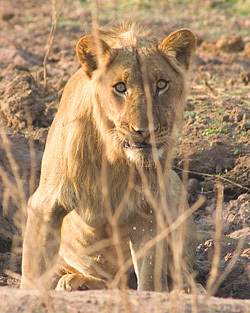 FarewellTravels: What other recommendations do you have for varying activities one does while in Africa? Simon Gluckman: Anything that gives you a more complete safari experience is recommended. Beyond the above mentioned activities, there's horseback riding, mountain biking, micro light sightseeing flights, hot-air balloon rides, and Great White shark cage diving opportunities--all lots of fun and providing you with experiences not possible on standard game drives. Fishing would have to be one of my favorite “side activities” while on safari. 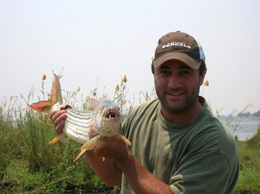 There are several native fish species that can be great fun to catch such as the Tiger fish (pictured with Simon in the sidebar) and Nile Perch. Photo credits: Courtesy of Simon Gluckman. 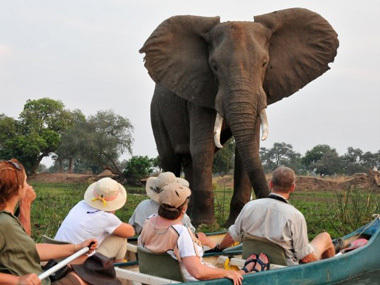 Photo of elephant near canoe and in sidebar, of Simon with Tiger fish, taken at Mana Pool National Park, Zimbabwe. 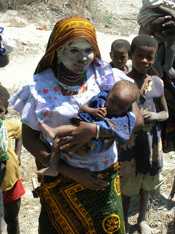 Photo directly above was taken at a Matemo Village off the coast of Mozambique. Call us at (203) 222-7238 (EST) or e-mail us here. Born in South Africa, Simon has been exploring the African continent for over 30 years. He is an authority on all levels of safaris from rustic and simple to ultra-luxurious and specializes in customizing the safari experience. For more information, contact us by e-mail or phone (203-222-7238 EST).